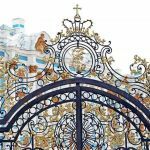 Our pictorial round-up of the sights and attractions that we visited and you can enjoy, over just two days in St. Petersberg. 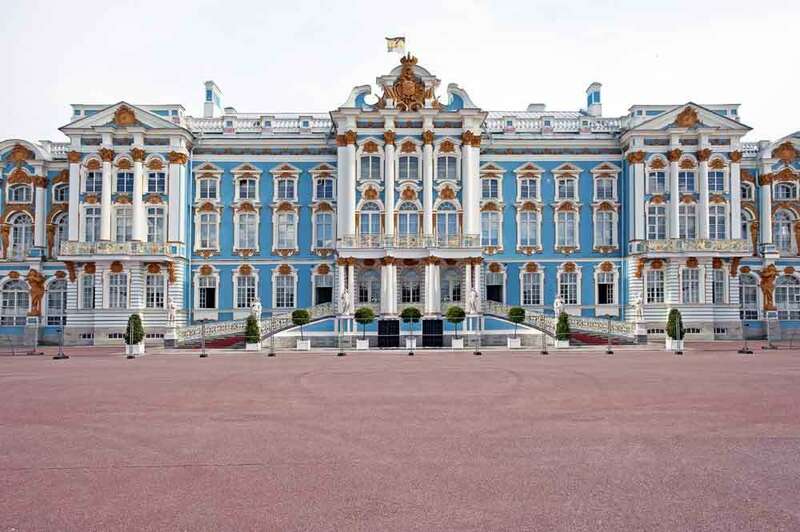 The scale of St.Petersberg is grand, with Russia’s cultural and historic heritage frozen in time. 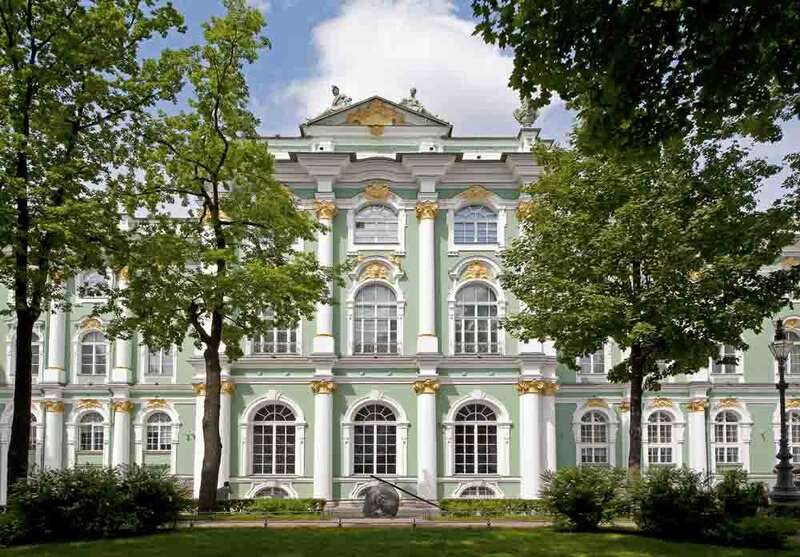 Founded by Tsar Peter the Great’s travel to all the major European capitals as inspiration for his new Baltic capital, St.Petersberg today encapsulates much of this with its finely preserved architecture and priceless art collections. It certainly promised to be a real eye-opener for us. 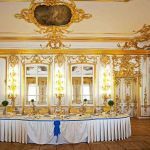 With the personal attention of our excellent guide, Natalia, from St.Pete’s Private Tours we were able to absorb a tremendous amount of information and see a dazzling array of riches within St. Petersberg – from palaces and forts to gold and porcelain, gardens and churches, ballet and borscht. 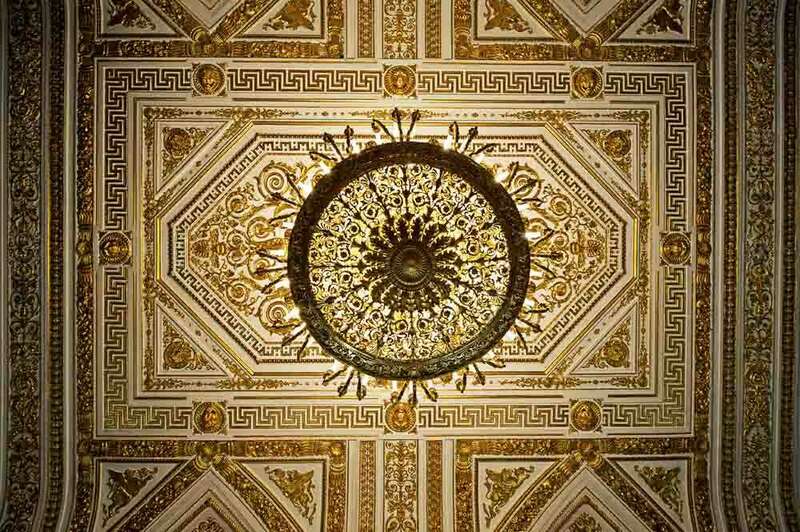 We defy you to become jaded by this amazing city. 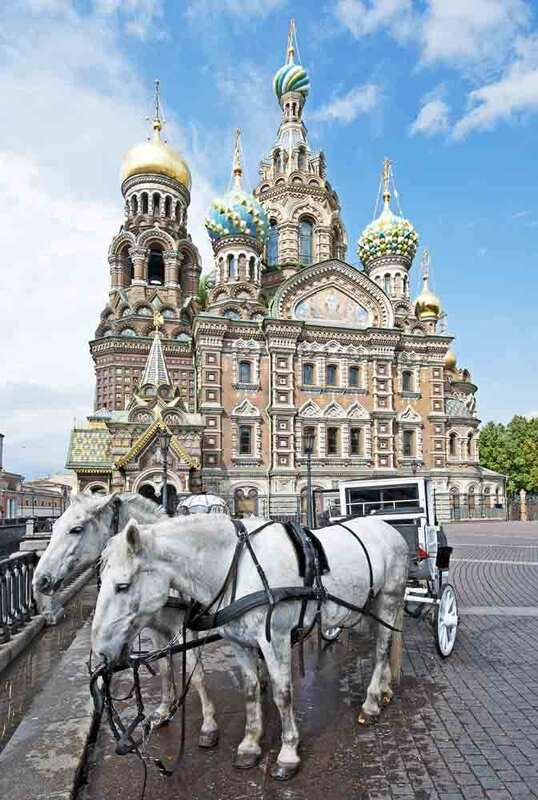 We think you’ll be booking the next plane out after you get a taste for the magnificent sights that await you in St Petersberg. 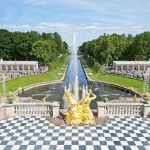 With the exception of Peterhof Palace and Catherine Palace, all sights are within walking distance in the city centre but it’s still a bit of a hike if you don’t have transport and want to cover it in one day. 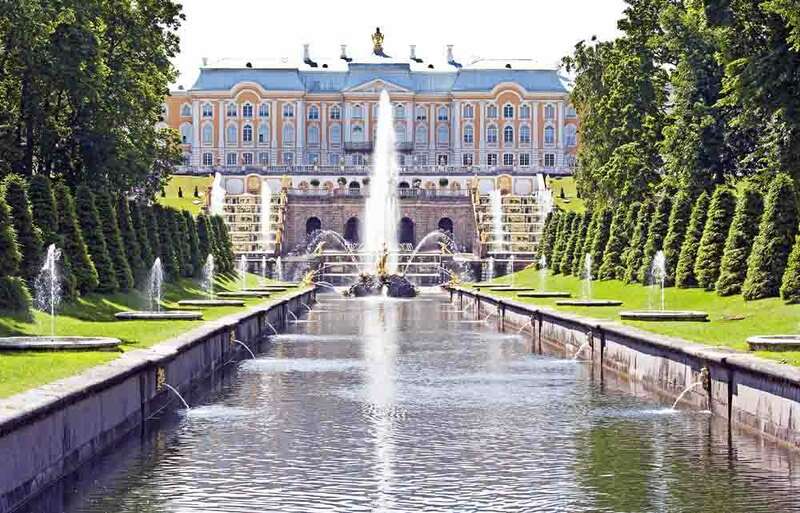 Other than the Peterhof and Catherine Palace we’ve put them in order of importance (in our opinion) but not location, with those at the end being sights to see as you drive or walk by but don’t perhaps need to linger over. 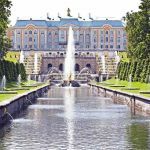 It’s roughly a forty minute drive from the city centre to the Peterhof that passes through the leafy suburbs and villages around St.Petersberg. 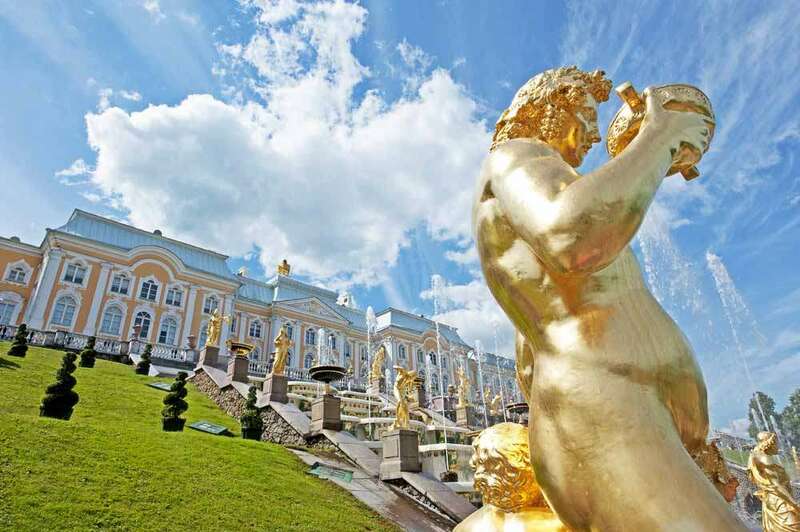 The Grand Peterhof Palace itself is a collection of palaces and gardens commissioned by Peter the Great, with the main palace set on a bluff overlooking the beautifully geometric gardens towards the sea. 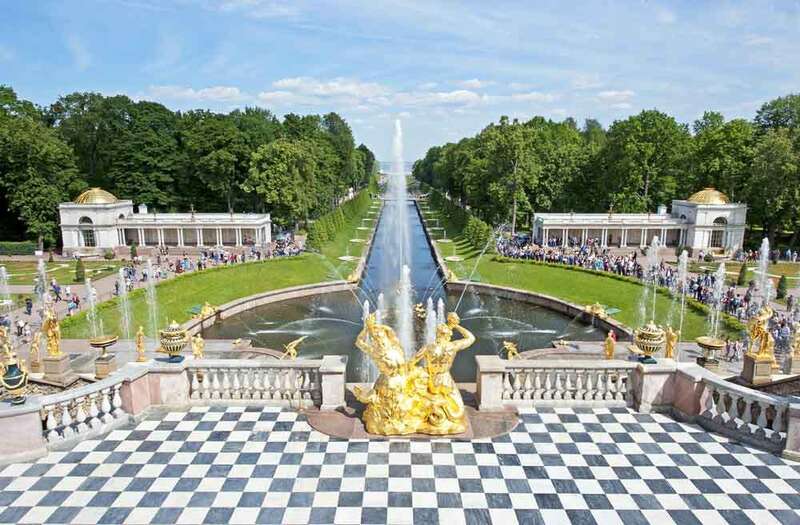 Referred to as the Russian ‘Versailles’, the Peterhof is a must see. 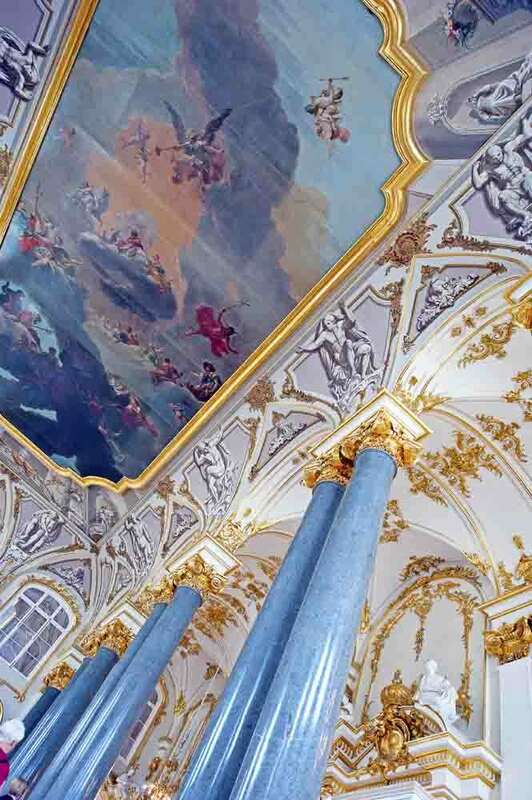 Being the first of our visits we were blown away by the ostentatiousness of the neo-classical and baroque decoration and the scale of Peterhof; little realising that within two days we would be so overwhelmed by the richness of St.Petersberg’s landmarks that we would become almost blasé about its riches. 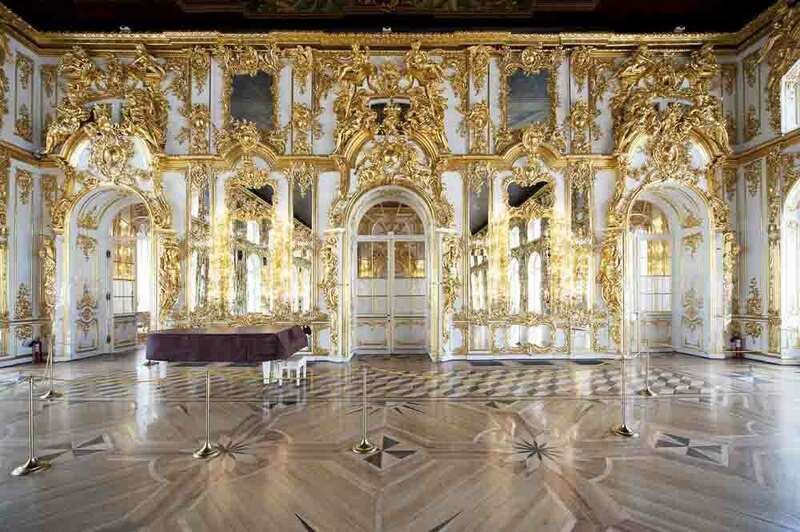 The stunning thing about Peterhof and other palaces we were to see is that they were virtually all gutted by Germany in the second world war and it’s a huge tribute to Russia that she has meticulously rebuilt and refurbished them to such an impeccable standard –a truly remarkable feat given the plethora of highly skilled people that must have been needed to fulfill such a gargantuan task. 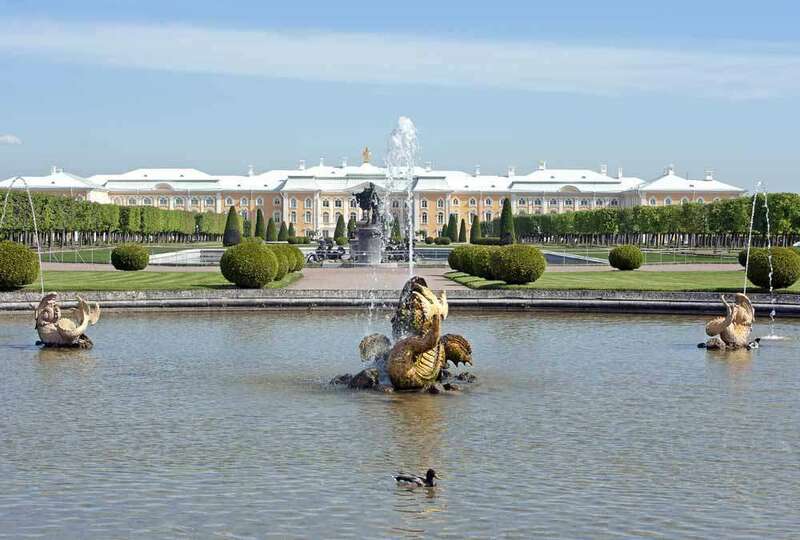 En route to our next visit we pass the Constantine Palace at Strelna, now the summer residence of Vladimir Putin – but as we hadn’t told him we were coming, decline to stop. 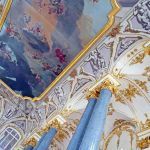 Catherine disliked the ‘whipped cream’ façade of this palace, the work of successive empresses but there’s no denying the overall impression this palace leaves you with – not least of which is the 150kilos of gold that adorn the stucco façade. 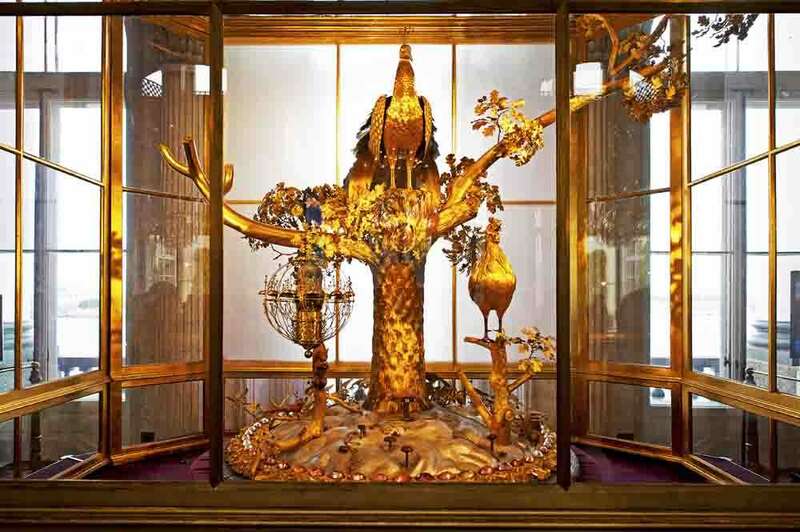 The interior follows the same theme and each room reveals an even more elaborate and sumptuous panorama of endless wealth, culminating in the Great Hall, or Hall of Light, a thousand square metre ballroom for banquets and masquerades that is either flooded by natural light in daytime or the flickering illumination of seven hundred candles (now thankfully, electric) in massive chandeliers. 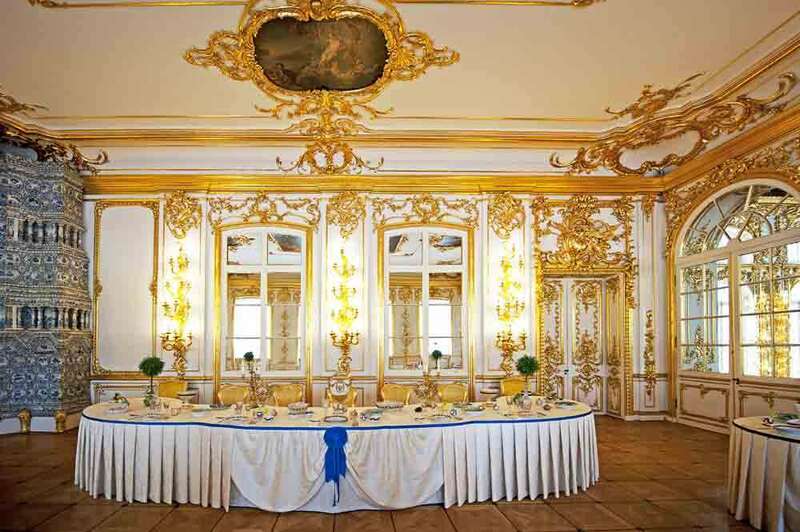 Again, deliberately gutted by retreating German forces of WW2, the rebuilt Catherine Palace mesmerises you to the extent that you don’t know where to look next – the fantastically decorated ceilings, the use of semi-precious and precious stones throughout, ornate ornaments, silk covered walls or fine furnishings – its truly magnificent. 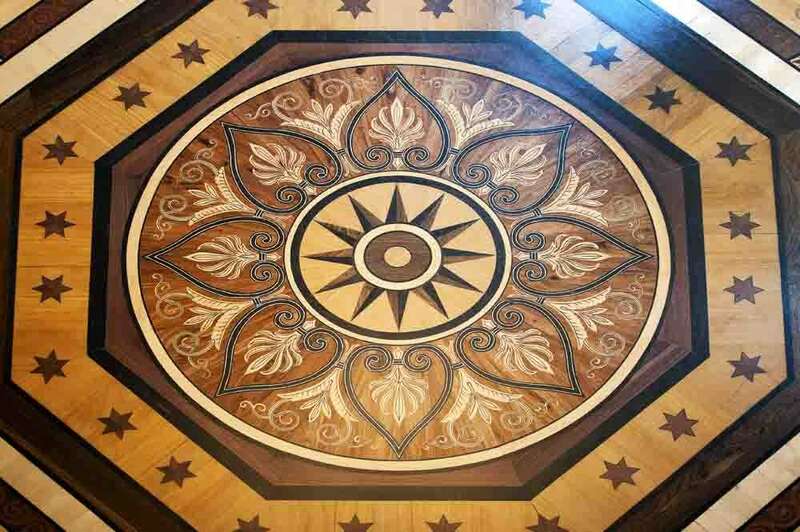 Situated in Pushkin, so named as the birthplace of the Russian poet, the Rococo Catherine Palace, surrounded by a huge semi-circular array of staff quarters is separated from the original village of Tsarskoe Selo only by a delicate cast-iron grille. How long have you got. Natalia took great pride in pointing out that it houses over three million artefacts (although a million are coins) – millions more than the Louvre and many on public display – so make up your mind whether you want to spend a week here or just an hour or so taking in the dimensions and grandeur of the buildings themselves. 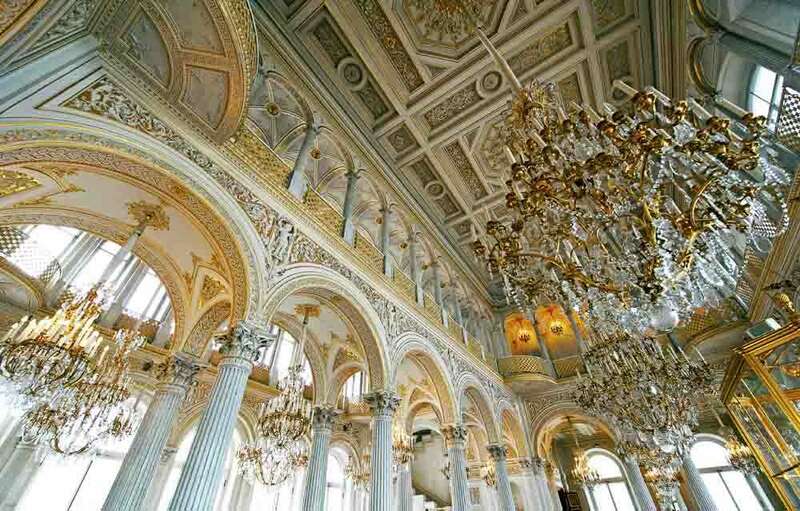 The museum occupies six buildings including the Winter Palace (former palace of the Tsars), Menshikov Palace and General Staff Buildings as well as the New Hermitage, Old hermitage, Small Hermitage and Hermitage Theatre (where you can buy tickets for evening ballet performances) – all of which are on a grand scale. 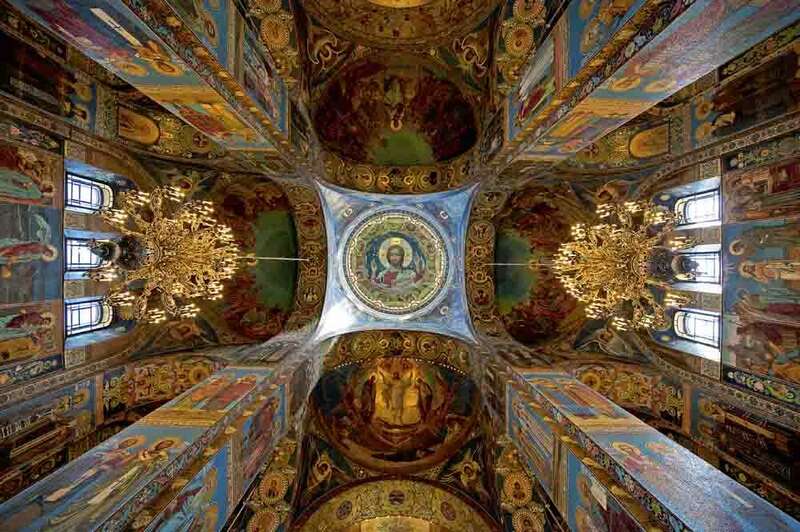 Styled in Medieval Russian architecture, the church is a shrine to Alexander II who was mortally wounded on the site by an anarchist’s bomb. The canal against which it stands was narrowed at this point to include the place where the Tsar was wounded within the church walls. 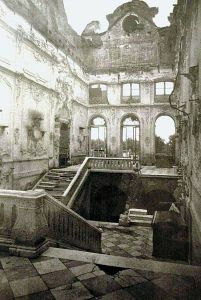 Ransacked after the Revolution it narrowly escaped demolition, saved at the eleventh hour by Germany’s siege of what was then Leningrad. 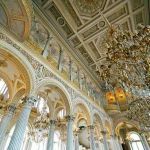 It is now a museum to mosaics and the highly colourful interior is one of the most impressive we saw in St. Petersburg. 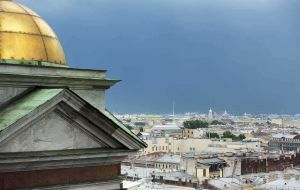 One of the main reasons for visiting the cathedral is to climb the narrow spiral staircase to the cupola in order to view all of St Petersburg. 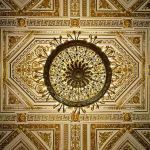 However, the cathedral itself is outstanding for the pure gold covering of the dome, its huge bronze doors and marble pillars, the cavernous interior – and most importantly the various paintings that (suffering from damp) were painstakingly converted into mosaics. 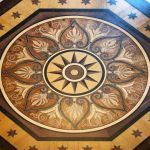 These mosaics are particularly notable for the almost identical replication of light and shade in the detailed illustrations, which deceive the eye into believing they are still paintings – amazing. 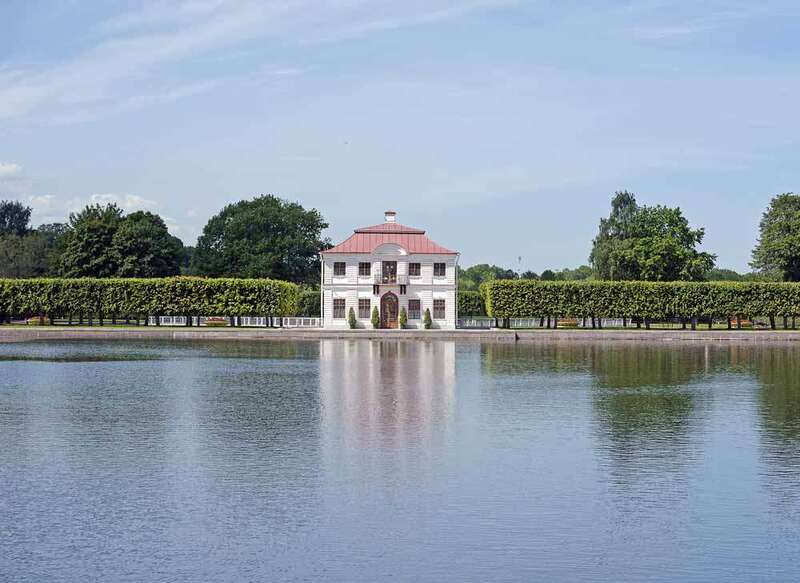 Established by Peter the Great in 1703 it resides on Hare Island by the north bank of the Neva River, the last upstream island of the Neva delta. Built to protect the capital from a Swedish counterattack, the fort was never put into effect. From 1720, the fort housed the city garrison and acted as a prison for high-ranking or political prisoners. 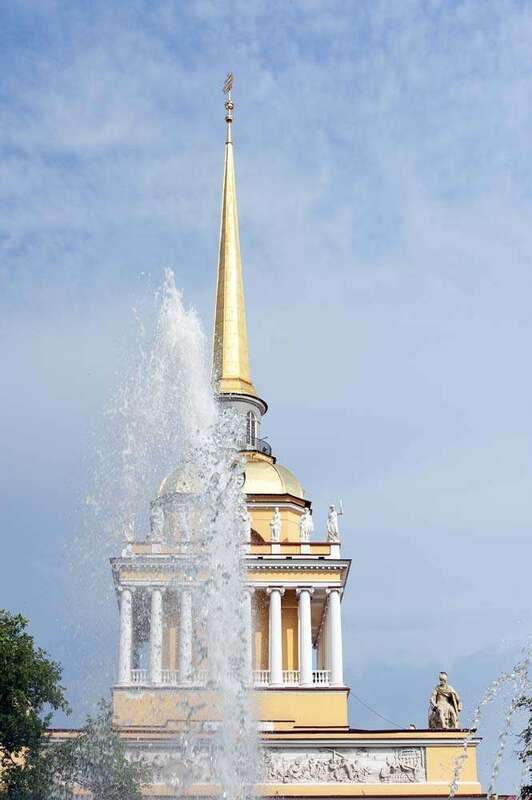 It’s an interesting stroll through the grounds and the Peter & Paul Cathedral makes for an imposing presence within the main courtyard. 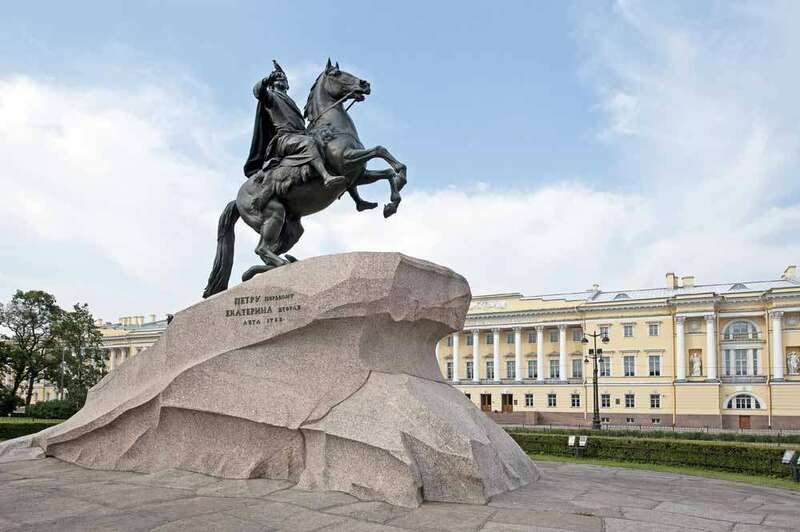 This equestrian statue of Peter the Great is situated in the pretty Senate Square gardens (formerly the Decembrists Square). Catherine the Great, a German princess who married into the Romanov line commissioned it to align herself as hereditary ruler following Peter the Great, although she had no legitimate claim to the throne. 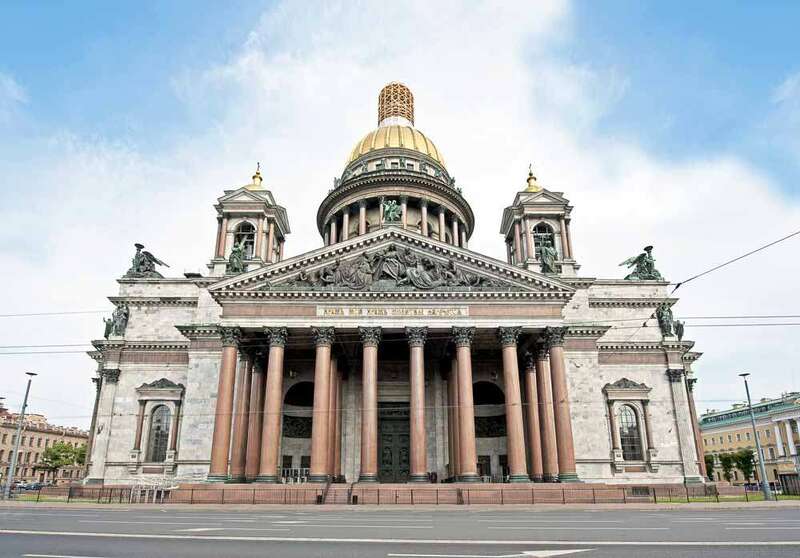 Planned by Peter the Great as the beginning of the road to Moscow, Nevsky Prospekt has greater popularity today as the main hive of activity in Saint Petersburg. 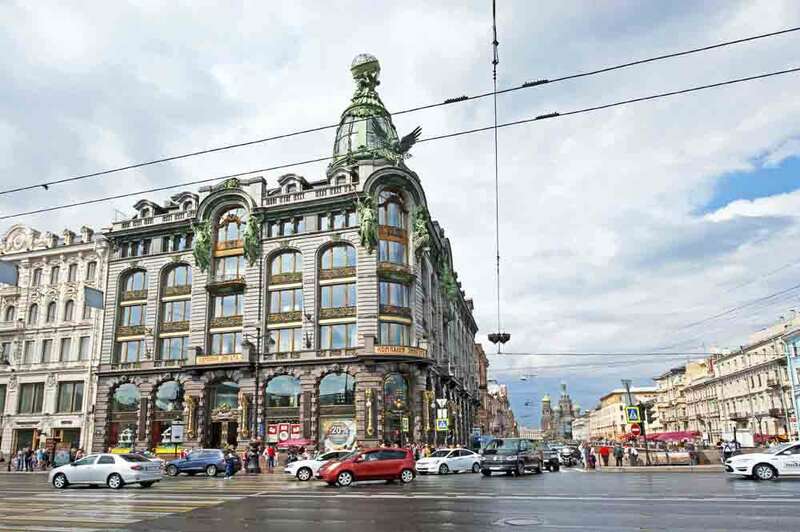 The majority of the city’s shopping and nightlife are located on or right off of the Nevsky Prospekt and various notable buildings, malls and churches are situated on it. 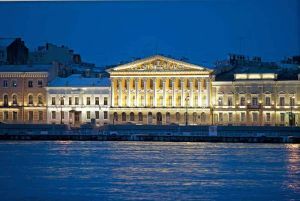 Completed in 1810 the Old Stock Exchange is most notable for being a replica of a Greek Temple with forty four Doric columns; the whole edifice occupying pride of place on Vasilievsky Island opposite the Hermitage Museum. 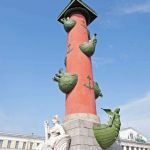 Completed in 1811 The Rostral columns opposite the Stock Exchange stem from a tradition originating in ancient Greece and Rome where they were erected to commemorate a naval military victory. 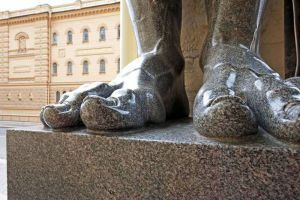 The columns sit on a granite plinth and are made of brick coated with terra cotta red stucco, decorated with bronze anchors and bronze ship prows (rostra). 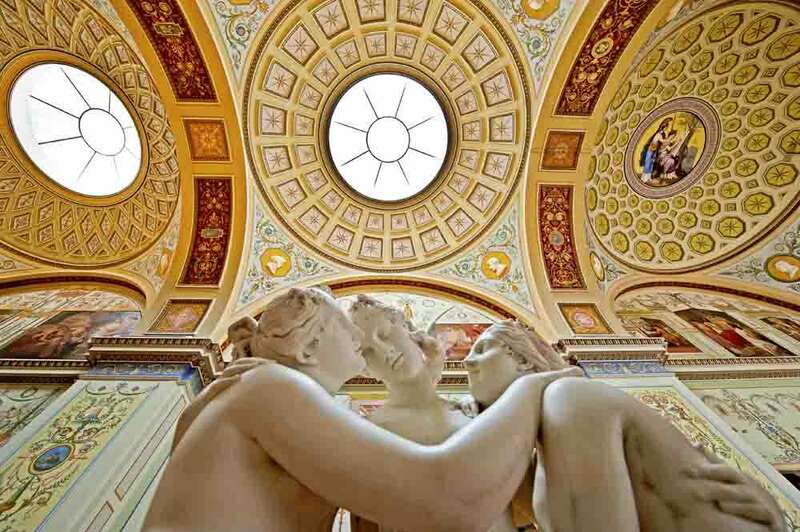 Seated marble figures represent the four major rivers of Russia. Originally intended to serve as beacons they were topped by a light in the form of a Greek oil filled brazier. 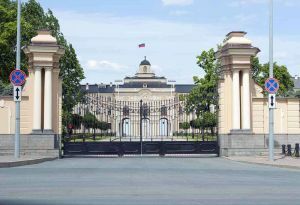 The Admiralty building is the former headquarters of the Imperial Russian Navy and is now headquarters of the current Russian Navy. 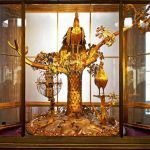 It serves the visitor more as a landmark for finding your way around, standing at the hub of St Petersburg’s three main streets Nevsky Prospekt, Gorokhovaya Street, and Voznesensky Avenue. 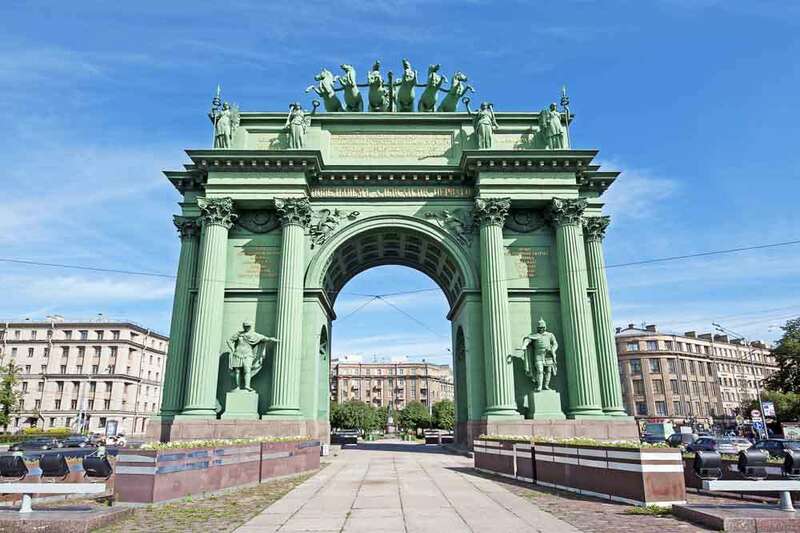 Built to commemorate Russian victory over Napoleon in 1812 as one in the eye for the French who had erected the Arc de Triomphe for his victory at Austerlitz. 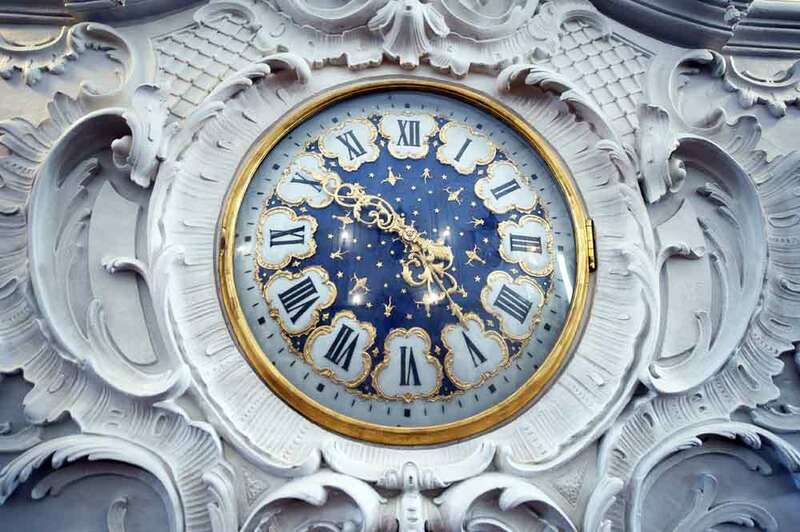 The arch was originally constructed in wood and then replaced in stone by 1834. 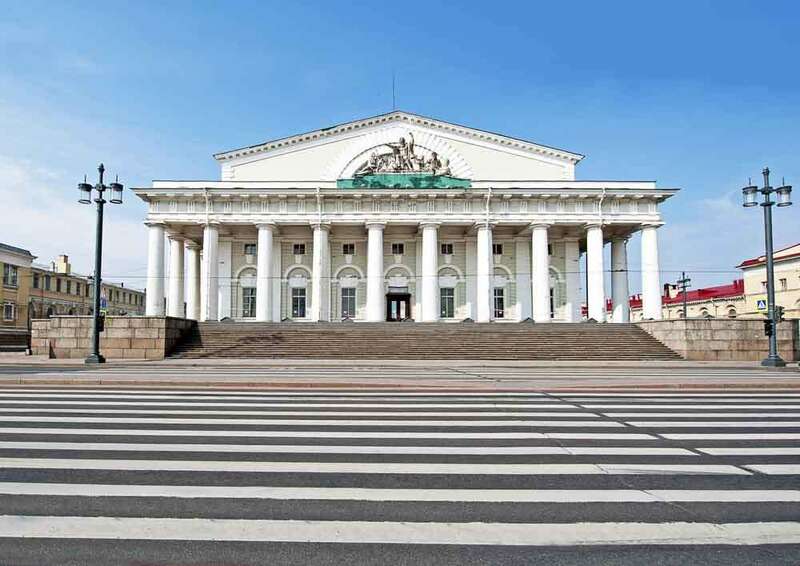 It’s notable for its similarity to other triumphal arches and its location within the huge Narva Square. 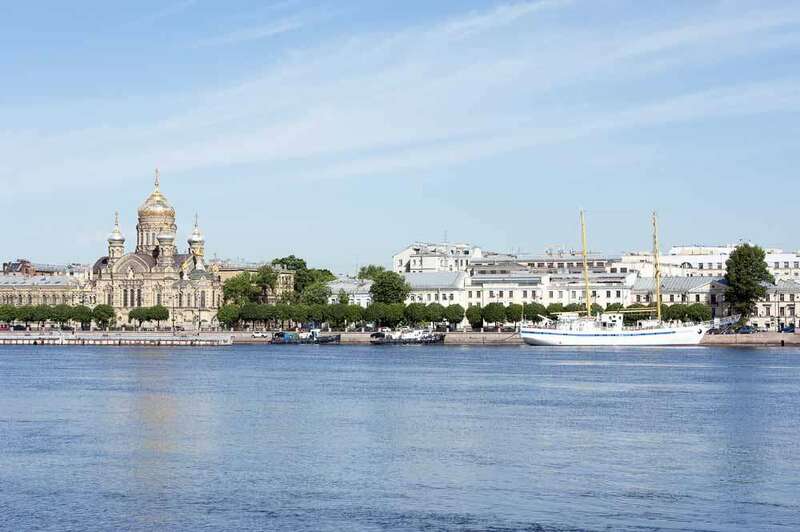 The spine of St Petersburg , the River Neva has had a pivotal effect on the city with its constant flood and freeze rotation. 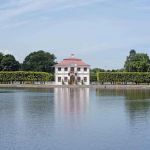 For the visitor however you can’t not see it if you’re touring but of particular interest are the substantial and attractive buildings that line the embankment. 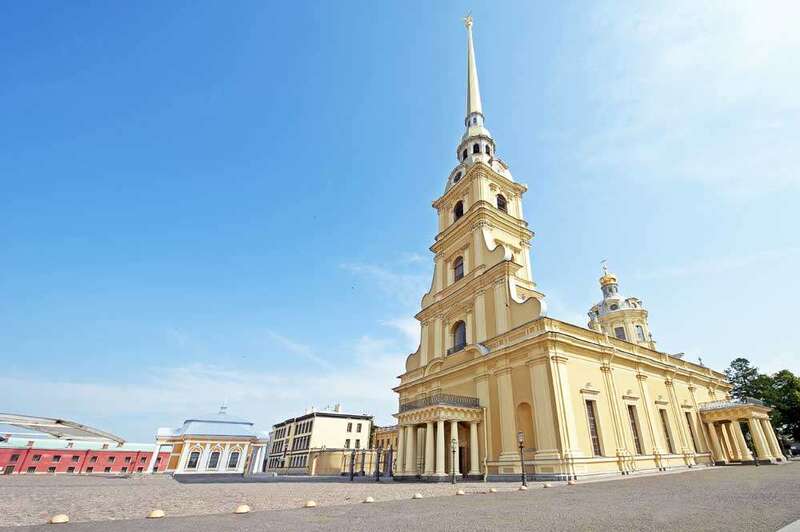 St. Petersberg fulfilled all of our expectations with regards the magnificence of its architecture and history – as well as being sufficiently ‘different’ as a destination to enjoy from the perspective of nightlife, culture and entertainment – but that needs another visit to appreciate it fully. 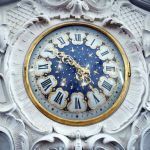 We’d want to return to St. Petersberg with more time to spare in order to fully embrace this wonderful city’s lifestyle. 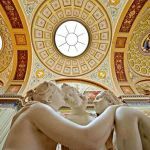 Part 1 explains our reasons for choosing the private guide company we selected for St. Petersberg and the added benefits that we hadn’t expected. 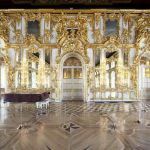 Part 3 will give you an insight into eating on the go and having a great night out at the ballet in St. Petersberg.